12-Point pattern design for off corner loading to prevent fastener damage and to increase torque on rounded fasteners. The sleek head design fits into areas where most standard wrenches will not fit. Chrome finish provides corrosion resistance and durability. Set includes: 1/4, 5/16, 3/8, 7/16, 1/2, 9/16, 5/8, 11/16, 3/4, and 13/16 in. Husky's ratcheting combination wrenches feature a 12-point, 72-tooth ratcheting box end that needs only 5-degrees to engage fasteners. Each wrench is manufactured from chrome-vanadium steel and heat treated for added strength and wear protection; providing durability for a lifetime of hard use. Their polished chrome finish resist rust and corrosion and easily wipes clean of oil and dirt. Both the open and box end features chamfered lead ins for quick and easy placement onto fasteners every time. Husky's flex-head ratcheting combination wrenches feature a 12-point, 72-tooth ratcheting box end that needs only 5-degrees to engage fasteners and a head that pivots 180-degrees. 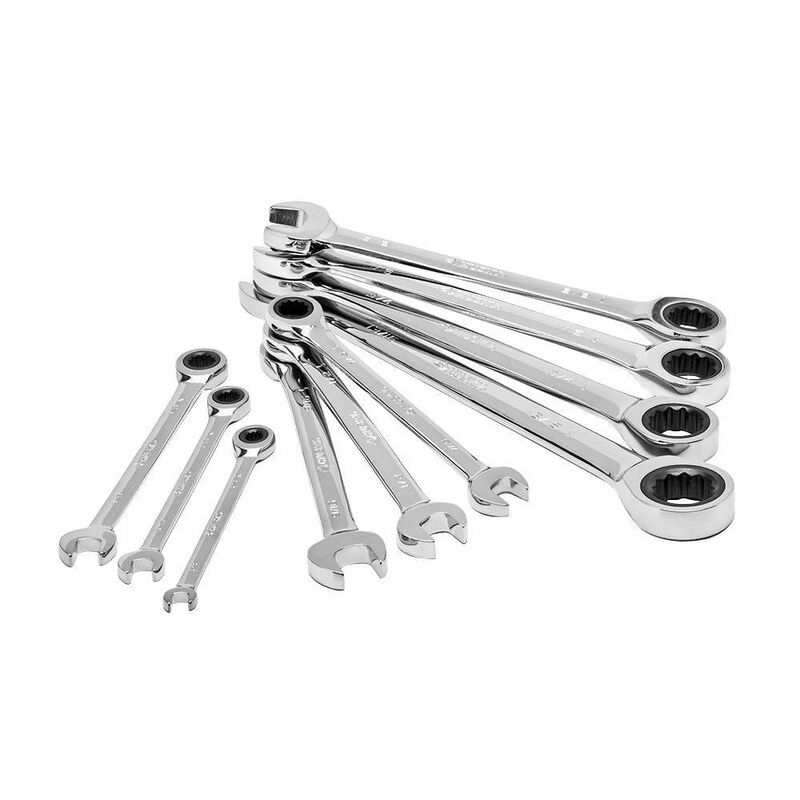 Each wrench is manufactured from chrome-vanadium steel and heat treated for added strength and wear protection; providing durability for a lifetime of hard use. Their polished chrome finish resist rust and corrosion and easily wipes clean of oil and dirt. Both the open and box end features chamfered lead ins for quick and easy placement onto fasteners every time. 7/16 in. Combination Wrench features durable chrome vanadium steel construction and a chrome finish for resistance to corrosion. This wrench is easy to clean and includes large size markings that are simple to read. Ratchet Wrench Combo 10pc Sae 12-Point pattern design for off corner loading to prevent fastener damage and to increase torque on rounded fasteners. The sleek head design fits into areas where most standard wrenches will not fit. Chrome finish provides corrosion resistance and durability.